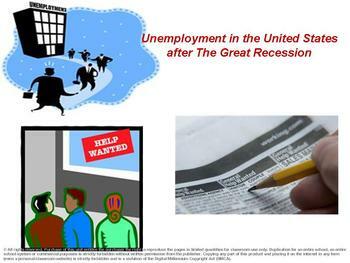 In 2008, the U.S. unemployment rate was over 10%. 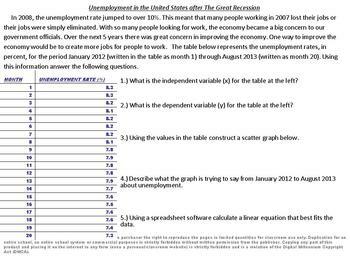 By August 2013, the unemployment rate dropped to 7.3 %. This activity may be a wonderful investigation into whether the “job market” is really improving and more people are finding jobs to support their families and themselves. Topics discussed in this activity include independent and dependent variables, graphing data, using software to generate a graph and calculate a “line of best fit or trendline”, and predict future outcomes. As an option to the teacher students are asked to investigate further into the data and the accuracy of their findings. This activity contains 6 pages with many investigative questions, an optional section for further investigation, and an answer guide. Common core standards covered in this activity include 6NS.C.8, 6EE.C.9, 7EE.B.4a, and 7EE.B.4b. Temperature's Effect on Insect Populations. Applying Algebraic Theory: An Advanced Approach. Environmental Issues Activities from a Mathematical Approach. Traffic Congestion: Year vs. Cost. Investigating Today's Issues by Applying Math Series. The Rising Cost of Healthcare in the United States. The Survival of the Florida Manatee. Traffic Congestion: Years versus Hours of Delay. Nature's Population Control: Snakes versus Mice.